Registration with HMR Referrals provides you with a portable, electronic clinical system that’s fully supported and purpose built for the Australian market. Our HMR eReferrals process is focused on providing accurate patient medications information to accredited pharmacists in an accessible form. 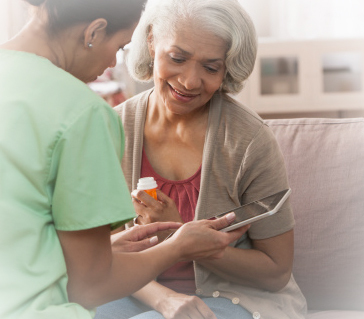 The system is designed to produce a better medications management regimen for each patient through better communication between health professionals. There are no annual membership fees, software license fees, upgrade costs or setup costs. The HMR Referrals system provides a pre-populated online report draft for efficient and paperless completion. This allows you to capture patient notes at the home visit and complete the HMR report later. Progress reports and your HMR Report is delivered directly to the referring GP. Boost your earnings by selecting the number of jobs that suits you, up to your monthly quota. Do as many or as few jobs as you choose, in locations that suit you. Maximise your earnings potential by joining Australia’s only GP connected HMR Referrals network. The incoming referral is populated with accurate patient information, medications and GP referral notes directly from the referring GP medical system. All communication with the GP about the referral is stored with your patient notes. Accredited Pharmacists are provided with a web based service to transact electronic HMR referrals and be able to both accept jobs on the go and create HMR reports at their convenience to be delivered to the referring GPs. Notes can conveniently be captured at the point of care or later at another location. No up front or ongoing costs , simply sign on. The HMRs have a transaction fee which means that you only ever pay for jobs that you accept. Choose home medicine reviews in the locations that are convenient for you. You set the appointment schedule with the patient, and you complete the report at a time convenient for you. The entire workflow goes from provider to provider with no admniistrative tasks in between. No need to pay for paper, faxes, postage, phones, printers, admin staffing, office infrastructure, clinical systems. Purpose built for Australian providers. Any information exchanged between referring GP and yourself is encrypted so no one else can see the information you’re sharing. Instead of spending time rewriting or rekeying information the GP already has in their system, you can concentrate on reviewing the medications and recording the changes recommended. No faxes, no transcriptions, no truncated or missing information, no need to fill in information the GP already knows, no rekeying of medications, no miskeying. Taking you less time to do your HMR report. HMR Referrals follows national guidelines for electronic and digital eReferrals. Less overhead on administration and correspondence with the referring GP means more time to focus on better assessment of patient medications. This allows you to improve the quality of patient care captured in your HMR report.